There are occasions where you want to try something new and experiment a little in the kitchen. Maybe adding a little of this or that to your gravy on a Tuesday night is probably not a very big deal. You know what is probably not one of those times to experiment and come up with your own concoctions? Thanksgiving. It is a bit risky. But I would be gladly willing to take some tips from chefs that I trust (you know…the kind of trust you get for people from binge-watching Food Network on the weekends because there is nothing else really on ha!) Giada thinks I should make a cranberry-orange glaze for my turkey? Ok let’s do this, Giada! 1. 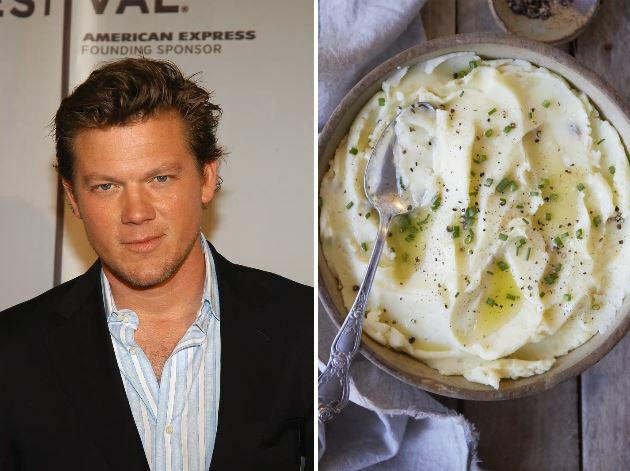 Tyler Florence boils his potatoes directly in heavy cream when making mashed potatoes. He adds his potatoes to a pot and covers them with heavy cream. He takes that same cream and butter and adds that to the potatoes and cook the potatoes in cream and butter. The results are super creamy, rich, and unlike any mashed potatoes you’ve had. 2. 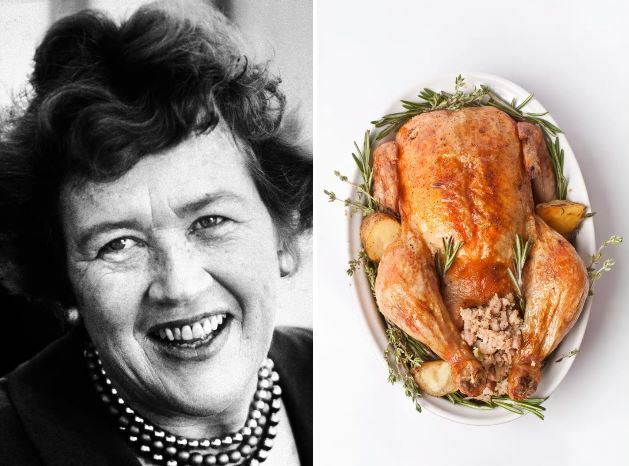 Julia Child wrapped her turkey in buttery cheesecloth while roasting to give it a deep golden color. Because of this, you won’t have to keep basting it with butter as it roasts. It becomes a golden, burnished roast that cooks in two hours and slices like a dream! 3. Martha Stewart tears her bread into small pieces and dries it out in the oven before making stuffing. She dries it out just enough so it holds its shape and doesn’t get too soggy. The hand ripping (instead of dicing) also gives it an unexpected texture that crisps up nicely. 4. 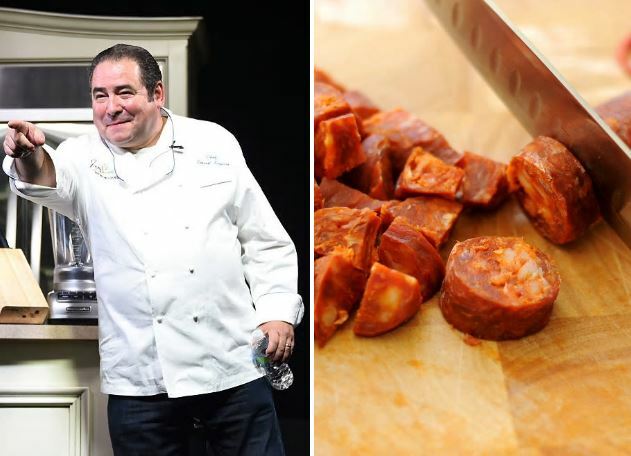 Emeril Lagasse makes his stuffing with chorizo to give it a spicy kick. He kicks up the flavor of “sometimes bland” stuffing by rendering spicy chorizo and cooking his veggies in it. That way, the bread soaks up all the delicious flavor and creates a stuffing that is bursting with flavor. 5. Nigella Lawson adds allspice to her gravy which gives it an unexpected pop of warm flavor. She takes it to a whole new level by adding allspice, cinnamon, and clementine juice to transform her gravy into something entirely. 6. 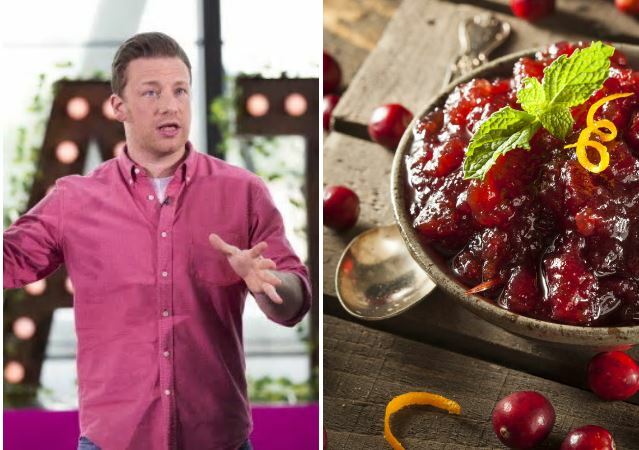 Jamie Oliver ditches the sad, canned cranberry sauce for a homemade version made with apples. He makes his own by cooking diced apples and fresh cranberries together with sugar and cinnamon to create something you’d really want to eat with your turkey. 7. Giada De Laurentiis finishes her turkey with a sweet and savory cranberry orange glaze. She says that it gives the turkey a beautiful shine and vibrant flavor that is perfectly sweet and savory. I’ll post her recipe for this glaze at the bottom of the article. Position an oven rack in the bottom third of the oven. Preheat the oven to 400 degrees F.
Rinse the turkey pieces and pat very dry with paper towels. Brush the turkey all over with oil, and sprinkle with salt and pepper. Arrange the turkey, skin-side up, on a baking sheet with the thick end of the breasts and thighs at the corners, the drumsticks in the center. Roast for 1 hour and 10 minutes. Remove the turkey from the oven and brush with the Cranberry Orange Glaze. Pour the broth onto the baking sheet to prevent drippings from burning and roast the turkey, covering loosely with foil if browning too quickly, until an instant-read thermometer registers 165 degrees F to 170 degrees F in thickest part of the thigh (do not let the thermometer touch bone), 20 minutes. Transfer the turkey to a platter. Brush generously with more glaze and let rest 25 to 30 minutes. Meanwhile, scrape all the pan juices and browned bits from the baking sheet into a large measuring cup. Spoon off and discard the fat that rises to the surface. Heat the pan juices in a heavy medium saucepan over medium-high heat. Whisk 2 to 3 tablespoons of the glaze into the pan juices (or more if desired) to make the gravy and bring to a simmer for the flavors to blend. Slice the turkey and arrange on the platter. Garnish with herb sprigs, oranges wedges and cranberries, and serve with gravy. In a small saucepan, bring the cranberry juice, orange juice, marmalade and rosemary to a boil over medium-high heat. Boil until the glaze thickens enough to coat a spoon, whisking often, 15 minutes. Remove from the heat. Whisk in the butter, then season the glaze with salt and pepper.